Hi friends! So today’s Souper Bowl Sunday post is going to be a little unorthodox because, well, I just got home from an amazing 6 hour workshop on foods for healing with Meghan Telpner. Seriously, it was an unbelievable way to spend the day and not just because she made amazing gluten-free cinnamon spice muffins. It really tied together a lot of the nutrition info I’ve been learning at IHN in a really clear and easily digestible (har har) format. Plus, treats! I’ve also had a weekend chockfull of funtivities, such as seeing Wreck it Ralph and attending the Ice, Wine, and Dine festival on Elm St. (about which posts are forthcoming. They were both AMAZING! Seriously, go see Wreck it Ralph right now. And just try not to cry at the beautiful animated short at the beginning, I dare you!). I guess what I’m trying to say is on top of school work I was out and about and didn’t plan ahead enough to get a chance to prepare my Roasted Red Pepper and Tomato Basil soup in time for today’s post. Also, I was unable to get photos for the soup since the time changed and it’s getting darker earlier and I just walked in the door about 5 minutes ago. The final light bulb in my living room may also have burnt and I am too short to change it even standing on a chair, so it will have to wait to be replaced until my freakishly tall brother arrives next weekend, which means no night time photo shoots. However, despite the fates conspiring against me getting a post up about soup today, I’m still totally going to give you my Souper Slack on the Go recipe. So I’m sure everyone can relate to perhaps being overzealous in your purchasing or preparation of veggies, leaving you with “on the edge of turning” produce in your fridge at week’s end. This is exactly what happened to me this evening! If you read Monday’s post about my preparation for Frankenstorm, you know that I made a big batch of roasted beets, red cabbage, kale, Brussels sprouts, garlic, onions, and walnuts with some sea salt, balsamic, and bone broth (the recipe for which I got from Meghan’s cooking class. I tried to find it on her blog to link it, but it didn’t come up.) Well, I ended up not being home as much as I had anticipated, nor was I trapped in my apartment for several days due to the storm, so tonight when I got home half of that casserole dish was staring at me accusatorily from the fridge. Rather than throw away perfectly good veggies, I dumped them in a pot with some broth, heated it up for a couple of minutes, then pureed, and voila! 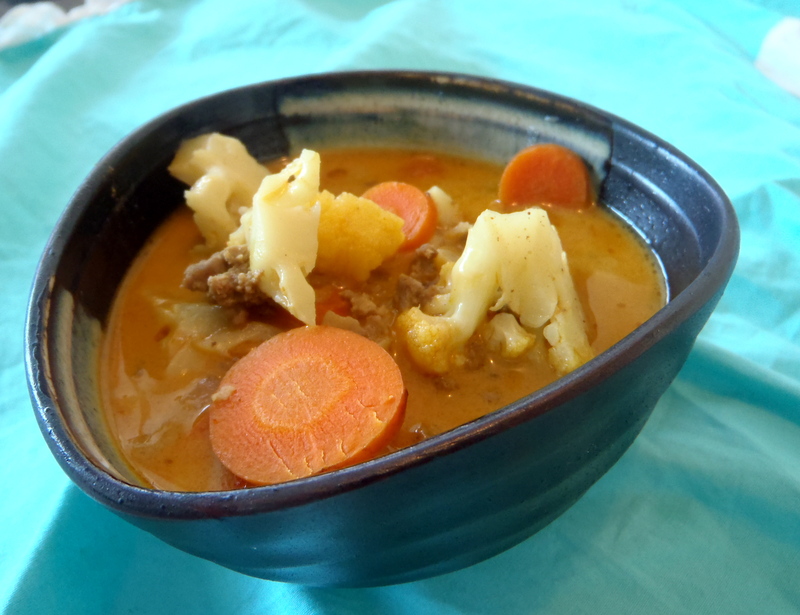 Easily digestible, crazy delicious, non-wasteful and super slack soup in about 5 minutes! Since the veggies were already cooked and flavoured, all I had to do was dump, pour, heat, and eat! You can even skip the pureeing step if you’re so inclined. Honestly, soup is one thing it’s really hard to mess up. Like you pretty much have to actively try to ruin a soup to come up with something inedible. Say you have some broccoli that’s going a little limp and sad. Throw it in a pot with some sea salt, broth, and maybe a little curry or cayenne, or whatever herbs or spices you happen to have in your cupboard. Simmer and serve. It’s really that easy. If you’re just getting your culinary feet wet I highly suggest playing around with soups because they are really quite easy to fix if you mess them up. Oversalted? Add some coconut milk or your non-dairy cream of choice. Not flavourful enough? Try adding some more salt or your favourite spice. Just keep tasting and tweaking it until you come up with something that makes your taste buds and tummy jump for joy. Now, I’ve been going all day and Gilmore Girls and Star’s Hollow are calling my name. Happy Sunday and happy eating friends!